Nan and I will be sailing with John Kretschmer again in April. Our trip this time will take us from Charlotte Amalie in St. Thomas to Ponce in Puerto Rico, by way of the Spanish Virgin Islands. 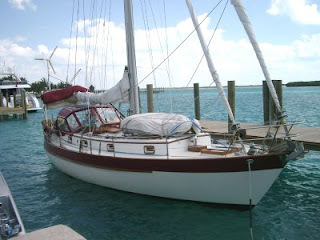 It's not a trip that's on John's regular schedule (http://www.yayablues.com/passages.htm), but he needs to get his Kaufman 47 sailboat, Quetzal, from where he ended his last trip, "Trans-Caribbean South to North: Trinidad to St. Thomas, via Grenada, the Grenadines, St. Lucia, Martinique" to where he will start his next trip, "Fountain of Youth: Retracing the route of Ponce de Leon from Ponce, Puerto Rico to St. Augustine, via Grand Turk, San Salvador, Hopetown." Our involvement is the result of a trade that John and I made at the end of our Odyssey trip last year. He agreed to take Nan and me sailing again in exchange for me redesigning his website. I am an Internet developer by trade, and I don't normally do freelance work, but John's offer sounded like a good one so we shook on it. With his comments and content, the redesign went smoothly and the new website has been in place now for more than six months. It seems to be working well as a marketing tool based on how quickly his trips sell out, so he's happy with his end of the trade. Now we're looking ahead to our end of the trade, with a departure date of Sunday, April 12. According to John, it will be a casual sail, with none of the overnight passages he normally plans, just daysails between marinas on St. Thomas, Culebra, Vieques and Puerto Rico. John has invited another couple, author Dallas Murphy and his wife, to join us but it will just be the five of us. I am in the process of reading Mr. Murphy's Rounding the Horn: Being a Story of Williwaws and Windjammers, Drake, Darwin, Murdered Missionaries and Naked Natives--a Deck's-Eye View of Cape Horn so I will have some topics for conversation. It should be a fun, relaxing trip. I will post updates and photos to my blog as we travel. I have been suffering from what I call "Golf-22" for my entire adult life. Golf-22 is an expression I have coined for the condition where you don't play well enough to get excited enough to want to play more to get better. A little history: I grew up playing golf, as did my father and his father before him. When I was four or five, I used to chase my dad down the fairways at Finkbine Golf Course in Iowa City with an old sawed-off wood, whacking a whiffle golf ball in a way that more closely resembled polo than golf. When we moved to Milwaukee in 1967 and joined Tripoli Country Club the following spring, my siblings and I played in the junior golf program. It was how we passed our summers. If you play enough golf in competitive situations, you will eventually become pretty good at it. By the time I was fifteen, I was shooting in the low eighties. But then I went through a growth spurt and the wheels came off. Whatever feel I had for the game disappeared. I couldn't even qualify to play on my high school's varsity team. After graduation, I stopped playing golf altogether. For almost ten years. When I picked up the game again in my mid-twenties, at the prompting of friends and family, it was like starting over. I still had a decent swing, but every shot was a crap shoot. I could hit the shot I intended once in a while, but more often I sprayed the ball all over the place or chunked it badly. My scores were terrible. Golf was so incredibly frustrating that it was no fun at all. I once walked off a course in the middle of the tenth hole. I went home and cleaned my garage. And I had more fun. I have been in that mode for about twenty-five years now, playing only four or five times a year in the hopes that a miracle will occur and I will play well for a change. Anyone who plays golf knows that this is ridiculous; you can't get better if you don't play frequently. 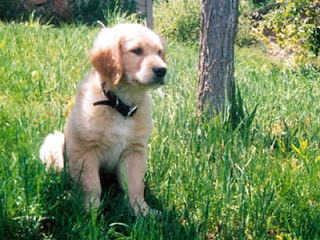 But given how badly I play, especially when I once played so well, there is little motivation to play more: Golf-22. All that is going to change this golf season. I joined the men's club at Redlands Mesa, and they play eighteen holes every Wednesday. If I play in every scheduled event, that works out to thirty-two eighteen-hole rounds. That's more golf than I have played in the last eight years. If I don't get substantially better, then there is no hope. The men's club season kicked off yesterday morning with a "1 Gross & 1 Net" event, and the four-man team I was on won it by six strokes! My handicap is so high that the three holes I somehow managed to par helped us secure a twelve-under-par net round. How's that for motivation? Nan and I had a discussion on Sunday night about my planned sailing trip with Paul and Honey Caouette from Miami to Bermuda, the first leg of their trans-Atlantic passage, which is scheduled to set sail on May 16. In the end, we decided that I should not go. The financial situation with my employer, Aspen Valley Hospital, is not good due to the slow economy and reduced skier numbers this ski season, so they are looking to do everything they can to reduce expenses short of lay-offs and pay-cuts. I would not have had enough paid time off accumulated to cover the almost three weeks the trip would take, and it would jeopardize my full-time status and benefits to take too many unpaid days off during these uncertain times. I emailed Paul this morning with my regrets. I haven't heard back from him but I hope he understands. He and Honey have two other people lined up for the entire passage from Miami to Portugal, so they should have adequate watch coverage without needing to find a new fifth crewmember. I left open the idea of Nan and me joining them for a future trip, so there may still be an opportunity to sail with them aboard their Valiant 40, Wild Iris, if they don't decide to sell her in Europe at the conclusion of their adventure. In the meantime, I offered to do whatever I could for them while they are in transit. Jeff, one of the crewmembers, has set up a Google Group, "WildIris", so I'll post updates from it as they come in, starting with the photo in this post, which was taken during the Caouettes' trip to the Bahamas last year and is the group's icon. Stay tuned. This morning we were finally able to give Jerry his new used bike. We would have done it sooner but there were too many homeless people hanging out in the park whenever we drove by, and we didn't want anyone to take offense or for Jerry to be uncomfortable. Nan and I parked across from the park and she called Jerry over. He seemed genuinely touched when Nan presented him with the bike and a good bike lock. He looked the bike over and said he had a plastic bread tray he could wire to the rack for Bear-Bear. In case there was ever a question about ownership of the bike, I took a photo of Nan giving it to Jerry. We could tell this made him a little uncomfortable, but he smiled and said we should come back after he had the bread tray in place to get another photo that included Bear-Bear. To make sure the bike fit him well, we asked Jerry to take a quick spin around the parking lot. More smiles. Nan told him to be careful--"No more falls!" --and crossed the street to talk with Jerry's friend Scott, who was in the park with Bear-Bear. Jerry shook my hand and said, "Thank you. Thank you Jesus." I told him he was welcome and watched as he carefully pushed the bike across the street and locked it to a tree. Nan returned in a few minutes to say that she had told Scott it might take a few weeks but that we would get him a bike of his own to thank him for looking after Jerry. As we drove away, Bear-Bear was sniffing the bike like she wasn't sure what to make of this new thing in her life. We hope she enjoys her new ride. Follow-up: In a word, no. It did not work any better. Blogger does not automatically interpret HTML tags from email postings, so I guess that means I need to stick to straight text from now on and just accept the formatting that Blogger puts into place. Lesson learned. Due to her unpredictable work schedule, it took Nan a few weeks to work out the details of getting Jerry a new used bike. This morning she did some shopping at Wal-Mart and bought a leash for Jerry's dog Bear-Bear to help keep her safe from traffic. She stopped by the park to give it to him and talk to him about the bike idea. 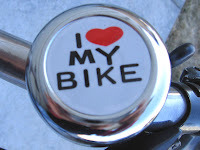 He was still interested, so when she got home she called Brown Cycles and asked about their used bikes. 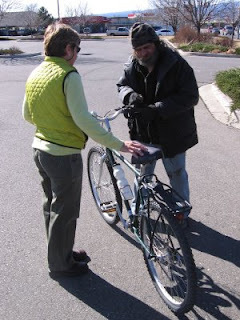 Mary told her that the nice Trek mountain bike George had shown me when I picked up Jerry's used-up bike had been sold but that they had other bikes in the basement that might work. 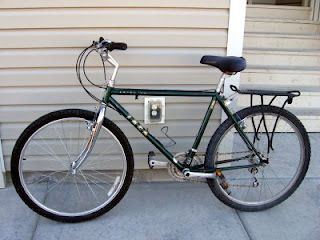 Nan stopped by there this afternoon and picked out a good used Trek Antelope cruiser. She is about the same size as Jerry, so she had them size the bike for her and then took it out for a quick test ride. It worked perfectly. She added a bell and a nice Blackburn rack to the package and then brought the bike home to clean it up a little. We haven't figured out how to work out a way to transport Bear-Bear on the bike yet, but we'll see what Jerry thinks when we drop the bike off with him tomorrow. If everything works out well, we'll go back to Brown Cycles to find another bike for Jerry's friend Scott and maybe also a basket for Bear-Bear. Stay tuned. 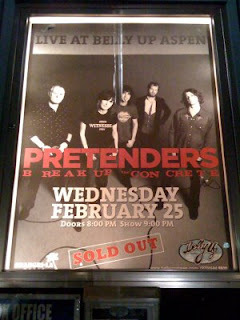 On Wednesday night, Nan and I were in Aspen to see the Pretenders at Belly Up. They are on tour promoting their new album, Break up the Concrete, and passed through western Colorado between gigs in Denver and Dallas. Belly Up's owner, Michael Goldberg, has done an amazing job booking first-rate bands into his popular nightclub. In the last couple of years, we have seen the English Beat, Deep Purple, Todd Rundgren, and the Dandy Warhols. 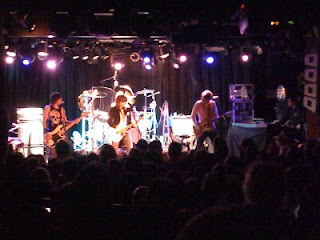 There are some important factors working in Belly Up's favor: the nightclub is small so most big acts sell out, even with high ticket prices; it is located in an area that makes it a natural link to larger cities; and musicians enjoy playing in Aspen, despite the high altitude, some even treating it as a vacation from their busy tour schedules. Whatever the particular reasons, we are more than happy to take advantage of the opportunities as often as we can. The Pretenders were terrific. They opened with "Boots of Chinese Plastic" and another one off the new album, and then launched into "Talk of the Town" and "Message of Love", two of their classic hits. They continued in that mode, switching between new material and old, for a solid hour and a half, ending with two two-song encores. The crowd went wild with every familiar song, like "Brass in Pocket" and "Back on the Chain Gang", singing the lyrics back to the band and bouncing around the dance floor like it was still the early 1980s. The place was packed so Nan and I stayed in our seats near the bar, where I took the photo below using my iPhone, which I have decided takes pretty bad photos in concert settings. The shutter is just too slow for the lighting, so the photos are always blurry. Photoshop helps but not much. 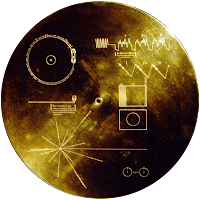 Click the photo for a larger view. The best thing about the concert for me was a new appreciation for how talented and unique singer/ songwriter/ guitarist Chrissie Hynde is. She has fronted the Pretenders since 1978, through the deaths of two original band members and a constantly changing line-up of musicians, but her music has never wavered. You can tell a Pretenders song in the first few seconds, or as soon as you hear her distinctive voice. Chrissie's guitar playing was incredible. I don't know what I expected, never having seen even a live video, but she played her silver Fender Telecaster like a rhythm guitar rock god, like Keith Richards if he could also sing like Mick Jagger at the same time. It made me think she must be the most talented woman in rock and roll. At age 57, she looks the same as she always has, with her trademark dark bangs and tight jeans, and shows no signs of slowing down. Go, Chrissie, go!